site is looking great Strum! And nice of you to display Rocker's new hairdo on the Portal image. Micheál wrote: site is looking great Strum! If you fancy a new colour theme check these out. Also, please don't make any donations at the moment or they'll disappear into cyberspace. How is your further education course going Strum? Thanks for asking GT, up to my goolies in it, but loving it. End of term exhibition most likely in the Lexicon Library. I'll keep you posted. I had two themes for the first half year, organic and man-made. The organic theme I chose is the humble Walnut, drawings, paintings, sculpture, and the man-made is an 18" replica of a Zippo lighter. This year I'm working on a theme named "Broken String" after I well, broke a string on my Guitar. 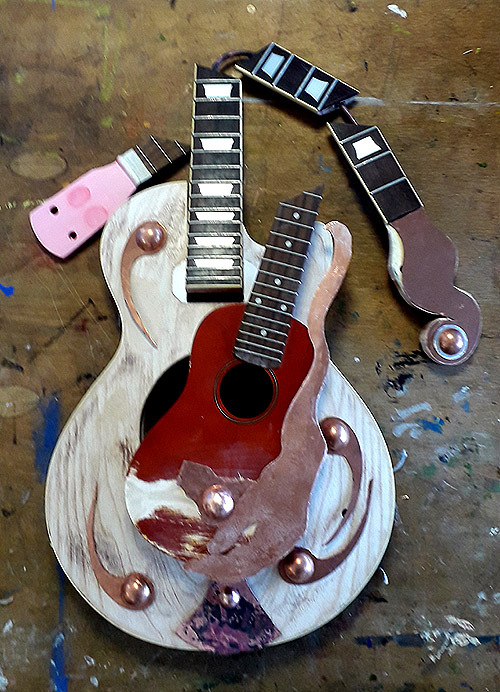 Funny where ideas come from, but I'm making a sculpture with wood and copper using a real guitar and a ukulele, both altered somewhat. Eat yer heart out Picasso. This is a sort of mock-up of the idea, working with Copper on Friday. Brilliant......yes it is funny.......the walnut in its form always reminded me of a flattened brain!!!!! Hope it continues to go well for you Strum. As for page colour theme ideas .... Greeb, Soul City and ID launch caught my eye. gingertom wrote: Brilliant......yes it is funny.......the walnut in its form always reminded me of a flattened brain!!!!! Hope it continues to go well for you Strum. Thanks a lot GT, I've been accepted into 6th level this/next year. All good. Thanks Toss, I need to "hammer it into shape" now. All will be revealed if you can make it to the end of term Exhibition. Toss wrote: As for page colour theme ideas .... Greeb, Soul City and ID launch caught my eye. Up to you, it's simple only a different background colour scheme. If you find any folks please post the link because there's so many of them. Strum is too busy to mention it, so I will . . .
Micheál wrote: Strum is too busy to mention it, so I will . . . Thank you Michael and thank you for the donation, much appreciated. To be transparent about costs folks, it cost me approx 60 euros to set this up with one years hosting free. From here on the hosting costs are around 80 euros per annum, that's 40 for the hosting and 40 to the webmaster to act as the server. Any extra work he may have to do he will charge a minimum for his time, but that's rare unless some problem crops up. So all in all it's very cheap for what we have. Tell that to your buddy Dancer. I sent an e/mail. Sinéad is having trouble login in and would like your help. Denis Cromie wrote: I sent an e/mail. Sinéad is having trouble login in and would like your help. Thanks for the breakdown of costs Strum. That's very reasonable when you think what some people quote. Small donation made. Now that you're hands-on in the control tower again, you might consider these two tweaks, assuming the latest software supports them. 1. Don't publish the date a Topic was initiated (it makes them look old and outdated), just show the date of the most recent post. 2. (You'll need to be logged-out to appreciate this) When an UNregistered visitor clicks a Topic, display it in Descending Date Order. Showing in Ascending Date order also makes the site look unloved and irrelevant (esp with many old images now blanked); visitors would be forgiven for moving on. Worthy site. Great job, Strum, Thanks to your Web man too. You mentioned this before Michael and I looked into it in the admin panel and I couldn't change the dates or what posts show first on the portal. I can ask if the code can be altered to makes those changes, stands to reason obviously. Yes so many old posts don't make sense without photos. I've sadly deleted some and edited others to make sense so please post links here of any that need "fixing" because there's so many to go through. I fear you're right; the software may still not support this. The phpBB's own Support Forum offers unregistered users the same oldest first view. Were you reading this? Seems to be such a big topic for some code changes? I need to check a few things first. Do members get email alerts for new posts and pm's? Also thanks very much for the support folks, much appreciated and well worth it to keep this site alive, I actually own the site now for the first time since I started it. I use to get E/mail alerts for posts and PMs but not anymore. Strum, many thanks for the work to keep the site alive.